Powerful Invention and Deadly Weapon. Tracing the process that transpired in the invention of the Atomic Bomb, the “Project Manhattan.” Many inventions have helped us – how we live and what we have become. The atomic bomb is one invention that became a turning point for humanity. In the beginning, America seemed determined to keep away from the war that had started in Europe while Germany was devouring other countries. However, on December 7, 1941, the Japanese commandeered a “surprise attack” on Pearl Harbor, and before America could mobilize, most of Southeast Asia had fallen to Japan. Slowly, the US took back territories occupied by Japan in the Pacific. Under the guidance of President Franklin D. Roosevelt, a top-secret joint effort between the United States and the United Kingdom was begun to build an atomic bomb. The project was called “Manhattan Project” known only to a small number of politicians and scientists. President Harry Truman only learned of it from the Secretary of War Henry Stimson on April 25, 1945 after he became a president, but not while he was vice president. The Manhattan Project was headed by military General Leslie R. Groves at an isolated location in Los Alamos, New Mexico. He chose theoretical physicist Robert Oppenheimer as the project’s scientific director. The project had numerous managerial and technical difficulties. By the beginning of 1945, $2 billion USD had been spent on the project. One other concern to be tackled was the best method of detonation. On top of it, while the bomb was being built, there was a huge pressure to maintain safety and to keep the world from knowing about it. The key element in the making of the bomb was the creation of plutonium in which although it does not exist in nature like uranium, when given the right stimulus, it could produce a chain reaction called “fission.” Physicist Niels Bohr investigated and made the concept understandable. The other prominent scientists involved were Enrico Fermi and Leo Szilard, among others. During fission, large amounts of heat and radiation are given off. The radiation produced is called gamma radiation, known to be the deadliest to humans. Fission occurs when the nucleus, which is the central part of an atom, breaks up into two equal parts. The nature of the atom is predictable and dependable for this process. Once a neutron breaks up the uranium atom, the fragments release other neutrons that break up more atoms, and so on. The chain reaction takes place in only millionths of a second and the amount of power released during this reaction is several hundred million volts of energy. The explosives are ignited through detonators. A shock wave is produced that collapses the sphere “setting off” the radioactive element like plutonium, resulting in the nuclear explosion. 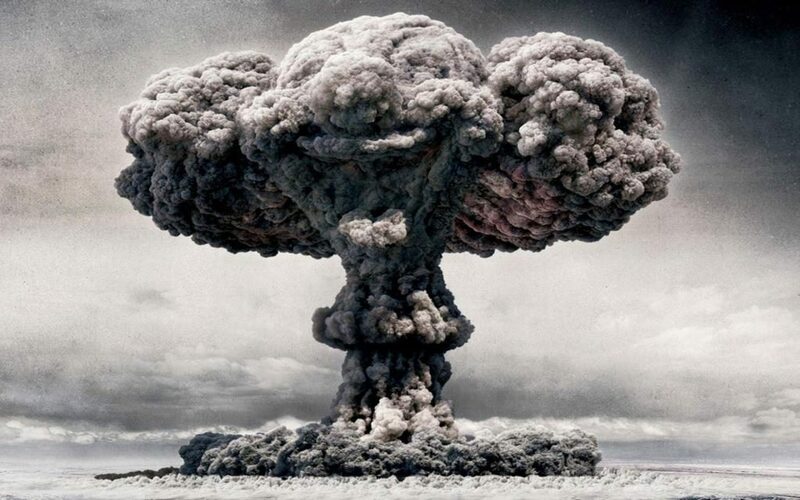 The first atom bomb was exploded in the desert of New Mexico, code named “Trinity.” It was placed inside a huge steel vessel named “Jumbo,” which was 6 meters long and weighed 200 tons. In August 1945, the historic bombing of Nagasaki and Hiroshima occurred. After the bombing, the US abruptly put an end to the Second World War, and began a task of unprecedented time for prosperity and peace. It might have been a necessary invention for what it was created for, but the atomic bomb stands to remain a deadly havoc to humanity.